Find both womens and mens incontinence pads below. Bladder control pads are used by millions for stress incontinence, urge incontinence, and many other problems. 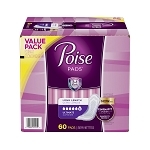 Find adult pads in this category that work for you, whether you are a man or a woman. Men's pads are built specifically for their type of body, and so are some women's pads. We have light, moderate, heavy, and overnight pads although you should know that no pad is going to be as heavy duty as a major incontinence product. For that, try a Tranquility Diaper for best results or McKesson Underwear if you want something very discrete and very inexpensive, but remember that you get what you pay for with adult diapers.